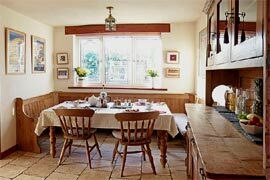 The Brush & Boot B&B is a charming, pet friendly country cottage luxury retreat, set in a splendid location within the Howardian Hills, a designated Area of Outstanding Natural Beauty. It is a pleasant walk away from Castle Howard, just 15 minutes drive from York Park and Ride and 45 minutes drive to Scarborough and Filey. The hosts, Richard and Kim Burn have a passion for art and walking and offer optional art courses, along with a walker friendly B&B. There are numerous things to see and do from Brush & Boot. Walk from the door on a network of great walks, including a walk to see the delightful Baroque Mansion, Castle Howard. The Centenary Way runs past the bottom of the drive with the North York Moors, Yorkshire Dales and Yorkshire Coast all easily reached by car. Travel on the North York Moors Railway from Pickering to Whitby or visit the historic attractions of York. 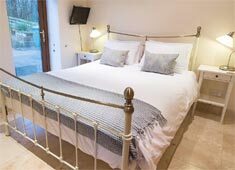 The Brush & Boot offers 4 rooms, sleeping up to 10; self catering, B&B or room only basis. 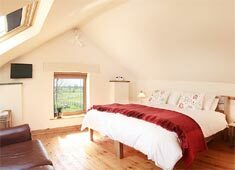 2 rooms are located in the Studio behind the main cottage which can be arranged as super kingsize, kingsize, twin, triple or family rooms. There are also 2 bedrooms available in the cottage, which can be arranged as 2 doubles or a double and twin. 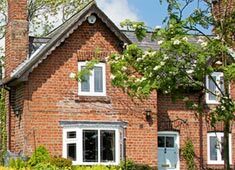 Bed & Breakfast Accommodation near York The Brush & Boot offers 2 luxury en-suite bedrooms in the studio behind the cottage. They can be arranged to suit with Super Kingsize, Double, Twin, Single and Family occupancy. Amenities for both rooms include memory foam mattress toppers, flat screen TV with freeview, wifi and powerful showers! A choice of breakfasts includes a delicious full Yorkshire breakfast made with locally sourced free-range produce, which is all cooked using a traditional Rayburn range. Free parking and high speed Wifi are also included.